Farmington Hills-based specialty grocer and food service company Plum Market plans to open a new small-format store in the Ally Detroit Center in the city’s downtown, between Campus Martius Park and the riverfront. Dan Gilbert’s Bedrock LLC owns the skyscraper that’s also home to Townhouse restaurant and Ally Financial Inc.
On its current trajectory, Plum Market would open two Detroit stores by mid-2019. The Farmington Hills-based specialty grocer and food service company announced plans a year ago to open a cafe and market this spring in the Henry Ford Detroit Pistons Performance Center in the New Center area. And earlier this month it said it signed on to open in the Ally Detroit Center skyscraper downtown in the summer. 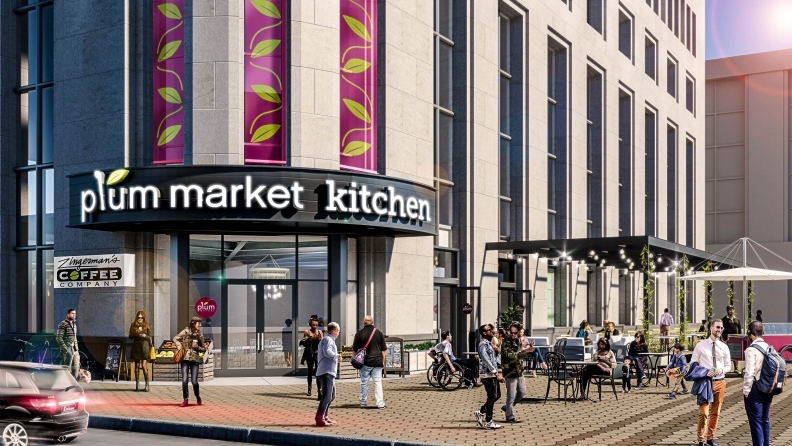 The two Plum Market Kitchens won’t be full grocery stores. The location at the Ally center, owned by Dan Gilbert’s Bedrock LLC, will sell “basics” such as condiments, bags of tortilla chips, cut fruits and vegetables, and possibly select seasonal produce, Plum Market co-founder and CEO Matt Jonna said. Plum Market Kitchen is a small-format spin-off of the full organics-focused grocery stores with which the company started. It has Plum Market Kitchens at Detroit Metropolitan Airport, Oakland University and Northwestern University north of Chicago. The 8,000-square-foot “street concept” store, set to open in the Ally building at 500 Woodward Ave., would have a cafeteria with hot meals, salads, sandwiches, soups and sushi. It’ll also have a full-service bar with wine, beer and liquor; a coffee bar; fresh-cut flowers; and Zingerman’s baked goods. 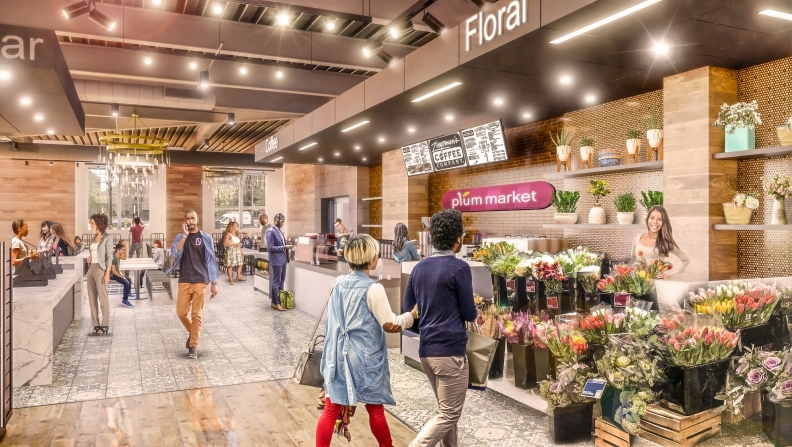 Plum Market’s downtown Detroit location in the Ally Detroit Center will sell flowers, prepared foods and basic groceries at 500 Woodward Ave. It’ll also have a full bar. It’s bigger than the usual Plum Market Kitchen model, with expanded grocery items and more seating, Jonna said. It’ll seat 100. A rentable event space called the Spirit Room will include patio seating in the easily recognizable building between Campus Martius Park and the riverfront. Saroki Architecture is the architect and Jonna Construction is the contractor on the incoming downtown store. Plum Market declined to disclose investment and lease details. Some of the 25-year-old, 979,489-square-foot building’s main tenants are Ally Financial Inc., Townhouse restaurant and law firm Clark Hill PLC. Plum Market will replace the Bistro, which was expected to fully move out in early November. Additional details on the change were not immediately available. Plum Market will enter a restaurant-laden section of downtown without much in the way of grocery options. City Market two blocks east sells some fresh produce. Further east of downtown is Detroit’s first Gordon Food Service on Jefferson Avenue and an incoming small-format Meijer nearby. The city could also see more Plum Market stores in coming years. Jonna said he sees opportunity elsewhere in Detroit to sell prepared food and groceries as more young people choose to live in the city. “We could have several more Plum Market Kitchens and even a full Plum Market store in the city with the way it’s moving right now,” he said. The 11-year-old grocery chain co-owned by Matt and Marc Jonna has large-format locations in Ann Arbor, Bloomfield Township, West Bloomfield and Chicago. Matt Jonna declined to disclose revenue. He said the company has seen an average yearly sales growth rate of 15-20 percent. Plum Market also operates 11 corporate and school cafeterias, including for Lear Corp., Grosse Pointe Academy and Detroit Country Day School. It expects to open three more next year. It also expects to announce another Plum Market grocery store in metro Detroit before the end of the year and is “working on several more” between Detroit, Chicago and Indianapolis, Jonna said.